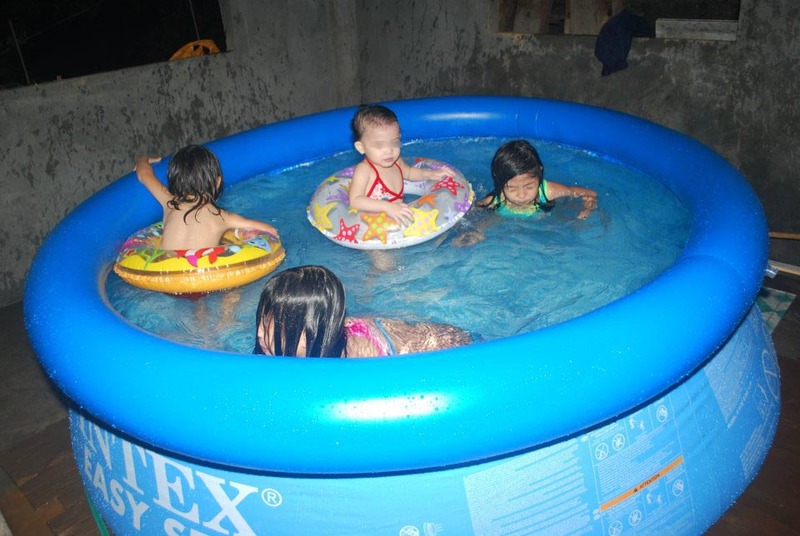 Swimming Lesson Marikina Area Part Two | Forget the drama! After my lessons I will be enrolling my daughter in a swimming lesson too. But as searching in OLX and other websites for affordable swimming lesson in Marikina area, I haven’t found that satisfy my needs. 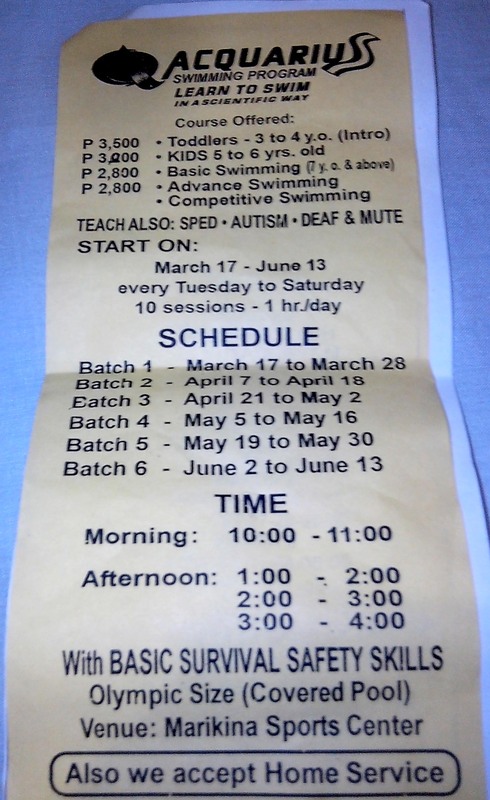 Fortunately, yesterday after I practiced swimming in Marikina Sports Center I have seen booths that offers a summer tutorial and there are two that offers swimming lessons. Perfect timing and their rates are affordable too. Please click on the photo for a larger image. That’s it pancit! I hope this post helps you. I wish I can join swimming lesson anytime soon . I enrolled my son in swimming lessons when he was 4yrs old. He enjoyed it but he was not listening to the coach so he just learned to float. hehehe! I’m reading a lot of swimming lessons now! Waaah. I want din! But I have difficulty in finding one here in my place. I’ll have my daughter and my son do something like this summer. It just look so much for the kids, and the same time learn from it. I’m thinking of enrolling my son to a swimming lesson class. However, I can’t find a class near our place e. Maybe next time. Thanks for sharing this. i’m sure your kid is certainly looking forward in learning how to swim. All my kids love the swimming lessons that they have weekly. I always wanted to send Bella to swimming class. Next year maybe because she is having ballet this year. I would swim everyday if we had a pool! That inflatable pool is a good size for kids to rally enjoy. Even adults can fit! although ive been swimming since childhood, I don’t swim the correct way, haha. So I am also thinking of having adult lessons, along with my husband. I took some lessons when my kids were younger. We took a group class and it was not too expensive. I’d like to try again. i hope your kid will learn how to swim.. It is so much fun! i love swimming as sports but i was not good in swimming…langoy aso sabi nga nila. hehehe. my son is somewhat afraid alone in deep water even wearing floaters. this is the reason why I want him to learn swimming. I enrolled my daughter in swimming lessons for 3 straight summers and now she already knows how to swim. That is great! I saw that pool when I frequent Marikina. It was inviting then esp with the summer heat. 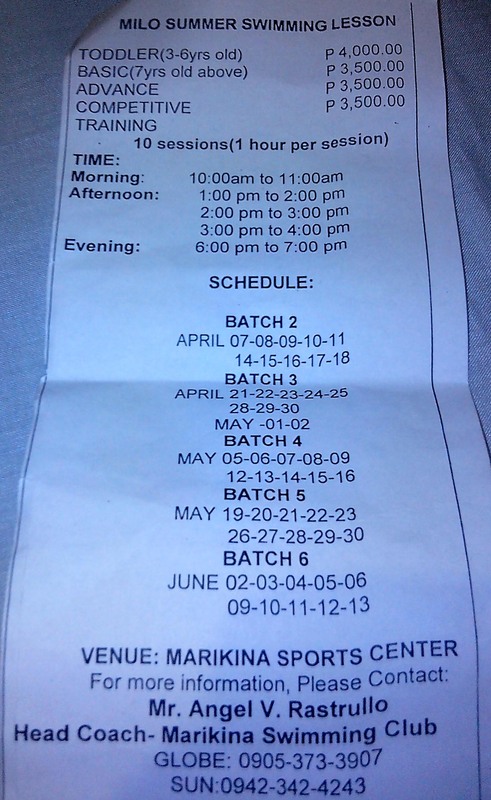 gusto ko matuto lumangoy wala bang mas late sa 6-7 pm? meron bang group of adult?